Across the state, migrant farm workers and advocates are drawing attention to an important issue they say could help them: driving privileges regardless of immigration status. Isabela did not want to use her last name, because she is an undocumented immigrant from Mexico. She is 49 years old, and has been living in the U.S. since 1991 with her husband. They have three children, all born in the United States. She spoke with WXXI through an interpreter. "I want you to know that we aren’t bad people, we’re good people. We are here because of the extreme poverty, and if I were a rich person in my country, I wouldn’t have left." Isabela and her husband found work on farms in the Finger Lakes to provide for themselves and their family. She also has a mother in Mexico who is a diabetic, so she and her husband often sent money to pay for insulin. Until one day, everything changed. "It’s really sad. On June 29 of last year, my husband was on his way to work. He wasn’t driving. There were three people in the car and the law enforcement officer who pulled them over, I think he did something really unfair." The officer asked all of them for licenses. Isabela’s husband didn’t have one, and he was arrested and eventually turned over to federal authorities. After a few months, he was deported back to Mexico. "I just want to say that this is just so unfair. I want everyone to know what we’re suffering and to help us. If we just had a license, it wouldn’t hurt anybody. And that way we’d be able to live our lives." Isabela says that if there were a process by which her husband could have legally obtained a license, her family would not have been split up. Wedade Abdallah is the immigration program director at the Legal Aid Society of Rochester. She says she often works with clients who are detained after traffic stops. Just before this year’s State Fair, advocates held press conferences in cities across New York. 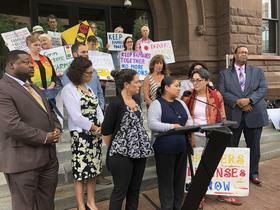 In Rochester, Carly Fox with the Worker Justice Center of New York called on the governor to pass an executive order to change the law. One of the reasons Fox is calling for an executive order is because efforts to move a bill through the state Legislature have stalled after two years. Opponents of the law say that those who cross the border illegally should not be rewarded with driving privileges. Assembly Minority Leader Brian Kolb released a statement that said, in part: If illegal immigrants are given driver’s licenses, how is that fair to people who have taken the time to go through the naturalization process? ... If you want the privileges of being a citizen of the United States and the State of New York, then become a citizen. Currently, 12 states have laws that offer driver's licenses to undocumented workers. Video by WXXI videographer Martin Kaufman.